Let’s Get Real: Is Your Dog Fat? You are here: Home / Dog Health / Let’s Get Real: Is Your Dog Fat? That’s not “more to love” or a “cute chubby little but”. That’s fat and it is unhealthy for your dog. With it your dog might not live as long or might get sick and not be able to live a life of adventure. Pet obesity is on the rise and it is a real problem. I get questions all the time about how I keep my dogs so trim. 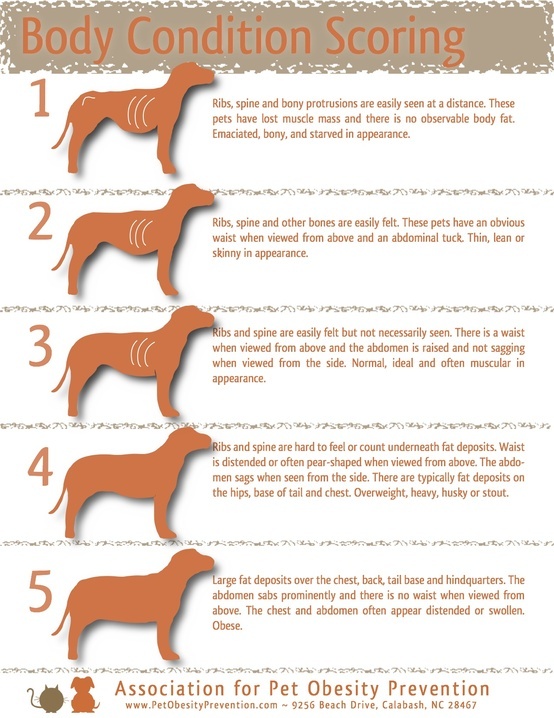 Here is a handy chart to asses your dog’s body condition from the Association of Pet Obesity and Prevention. If your dog is a 4 it could probably stand some lose some weight. If it’s a 5 then it definitely needs to loose weight. Pet Obesity is a big concern for me. At 5 am this morning I had a genius idea. I wanted to start a blog about dog obesity and call it “fatdog” or “fatdoghelp”. After a couple of minutes on GoDaddy and Google I found out that someone was already doing it. Thank goodness because I don’t need more stuff to do! I can barely find the time for everything currently going on in my life. So I am not a genius but I AM really glad that this website is out there. It’s simple but well done, easy to navigate and helpful. I would like to shake the hand of whoever is writing this. Go over and check out fat dog help (Update: unfortunately, it looks like this site no longer exists) for yourself. I also found this really great post written from a dog’s view on pet obesity called Obesity in Dogs. Fix It! If you are wondering if your dog is fat or what to do about it I highly suggest checking that one out too. Again, it is simple and gets straight to the point. This is a touchy subject. What do you say to a friend when you know their “baby” is just too darn fat without totally offending them? And what is they do know but choose not to make any lifestyle changes that would help? Good friends recently lost a dog to heart disease. The dog was extremely obese, the owner knew it but did nothing about it. My heart hurt for their loss but in the back of my mind was that nagging “you could have done something”. Of course I can never say anything, but darn it i wish they’d made some changes before it was too late. I am really sorry for your friend. It is always hard to lose a pet no matter what may have influenced it. Yeah, it is tough. Through our Adventureweiner Club, I see a few that are grossly overweight. I try to reach people indirectly through education or example but resist saying anything to the owner directly. However, I have had a couple of people as my opinion and I tactfully tell them what I really think (that yes, your dog is overweight). People just need to understand that having an obese pet means that they will be will you for a shorter time. I am worried about my dachshund. He is fat. “Tonka is my best buddy and I thought I was being “nice” by feeding him scraps. For the last 3 mos he has not had any scraps. He is still fat but we are going to start taking walks again. I Hope I can turn this around. I wish that more people understood the importance of keeping their dog at a healthy weight! When we see dogs that are at their ideal weight their owners think they are too skinny, it’s so sad! Love the diagram. I thought Sherman was losing weight so I increased his food a little, then I took him into work and he had gained 4 pounds! I was so bummed! Needless to say I adjusted his food again! I feel like it is all about education. I know about pet obesity being a problem but forget that some others either don’t or don’t realize the gravity of the situation. Since our blog is about the heath and fitness of small dogs, and I see more overweight small dogs than I do big, perhaps it is a subject I should talk more about on our blog. Great post, everyone needs to be aware of pet obesity. Great post. I am never overweight as I spend all my time in the park running around like a loon chasing squiggles. Have a terrific Thursday. The senior food has even more carbs and is really garbage. I’d never feed that. Great post! Mom started taking me running with her and we are both ready to be fit and healthy. Good for you and your Mom. I really like running (sadly, my knees don’t so much though. It really is a lot more difficult to determine than these charts make it seem. I know it looks simple but when your vision and senses are obscured by love or denial or just being accustomed to seeing your dog look a certain way. It can be hard to gauge. So many people have told me my dog is too thin, including people who know more than most about what neglect looks like. From the chart she is definitely a 2 but is also kind of a 1 because her ribs and spine are visible. There is nothing wrong with her muscle mass and I don’t think she looks emaciated but others have told me she does. This dog eats a ton of food! At the max of what is recommended for her weight. The vet says she is perfectly fine but charts like these make me question that. Nothing is easy, is it? Yes…It can be difficult as fur and denial can get in the way. I do think that people can get a good idea by checking their dog themselves against this chart. As with anything though, there are always exceptions. Each dog is different, like people, and have different healthy set-weights. According to this chart, a dog may appear slightly over or under weight but still be healthy in actuality. That is why it is always good to follow up with your vet. Chester is definitely on the thinner side as you can see most of his ribs but the vet said he is at a healthy weight. Nola’s about a 3. I can see the last 2-3 ribs, easily feel her hip bones and her spine. She’s solid muscule. I do want to get her down a few more ounces though; she should be at the lowest weight possible (while still being healthy!) for agility so theres the least amount of stress on her joints. I have heard that people with dogs in agility prefer them to be on the thinner side. It’s like any athlete – there is an ideal strength to weight ratio for maximum performance I suppose. What a lot of people don’t realize is that commercial dog food is a huge factor in making dogs fat. Dogs are not supposed to eat carbohydrates and that is all dry kibble is. Dry food is a major factor in causing diabetes, kidney problems and lots more. Just a switch to a more species appropriate diet can vastly improve a dog’s health. Feeding a “diet” kibble is not appropriate nor is restricting calories a great majority of the time. I don’t know what they were thinking when they made kibble. It’s certainly not something a dog should be eating. Yes…to much carbs OR fat/protein can cause pet obesity. Many people who feed their dog regular kibble with lots of carbs might switch to a grain free kibble (which is a step in the right direction) and keep feeding the same amount – causing their dog to become even more overweight because they don’t realize that the portions will likely need to be reduced. In my experience, there is the same danger with raw food too. Sometimes if one switches from kibble to raw (which can be more calorie dense), the amount of food given to your dog needs to be reduced. Actually I free feed and they get as much fat as they want and nobody is fat. Carbs are not required by dogs at all while fat and protein are. You don’t have to reduce the amount of food if carbs are cut totally out. And there is no danger with raw since it weighs much more than dry food. It naturally takes less to fill a dog. Of course, sometimes when switching a dog from kibble to real meat a dog will gorge themselves and overeat just because they can’t believe their great luck but as time goes on and they realize the great food is there to stay they chill out. That sounds like a wonderful experience. It was not mine. I switched from dry kibble to raw freeze dried. I didn’t know it was calorie dense and fed the same portion as the old food Big mistake. They all gained weight. I have since cut back the portions but I struggle thinking it’s not enough food. I have to keep telling myself they will be better off with less. Hi Dee. You can try adding thawed out frozen green beans (not canned because of the sodium) to your pup’s food to make up some of the volume without the calories. Most dogs love them. I don’t know how much you are feeding your pups but, for reference, Gretel is 12 lbs., and she gets about 1/2 cup of raw food a day – 1/4 in the morning and 1/4 in the evening – to maintain her weight. I have to reduce that amount a bit in the winter when she isn’t as active. Also, on days when I know she is going to get a lot of treats, I reduce that amount too. I can’t tell you the number of times I have seen dogs and thought they were overweight. When I ask what does your vet say about the dog’s weight, the answer is usually: “his/her weight is fine”. Our dogs generally need more weight, but we have no problem cutting them back when they start to gain weight. Over the years it has also been a give and take game for us to keep them at their healthy weight too. We’re lucky Eleanor works so hard to maintain her figure! Thank you for your post, feeding too much to a dog as much as we will like it, is bad for us in the long term! That’s why we also have a body score chart on our website similar to the one you have but we also have views of the dog from above which you may be interested in and we also have one for cats and rabbits! Thank you for making people aware! Heavens no! Mom is always being complimented on the great shape my sis and I are in – the way it should be. We are mom’s fitness buds so we 3 stay fit together. We have once cat on the chubby side which makes mom nuts but he has been that way forever. Keeping a dog fit is no mystery. Like people, it’s simply a matter of feeding them a high quality diet, not that commercial trash, and plenty of exercise. While part of me gets angry and disgusted with people who allow their dogs to become fat and call it “cute”, I realize some people just need education on proper dog care. Then there’s well meaning owners who just need to find a good balance between diet and exercise. There was once a time where my Pickles was fat. We exercised, he ate wet food, and my God did he get plenty of treats! It was a bit excessive, though. The fat seemed to just creep up on him. I woke up one morning to realize my cute little hot dog now looked like a ballpark frank! I also noticed a slight dip in his energy, and his bowel movements left something to be desired. I knew something had to be done. I cut back on his treats, switched to a dry food, and had to exercise double hard to lose the fat. And at the time, it was a struggle to get in extra exercise in with my busy schedule. Things would have been a whole lot easier if I just took the extra precautions. It was well worth it to make the change, though. Pickles is now at a healthy weight again, and the multiple comments on his appearance proves that. Not only is he in the best shape of his life, but I too have noticed improvements in my life. His exercise needs forces me to get off the couch and get a workout, and as most people know, exercise releases endorphins which makes you happy. I can’t wait for this summer. The pet’s are gonna have a hot mom. And with recently adopting Penny, all the more reason to go for a jog. Seriously, she won’t let me be lazy. She’ll yell at me by the door until I do. Is there any better motivator than a dog? Lol. Anybody like win turducken? It’s what you get when you treat your dogs right. A great post to remind pet owners the benefits of a fit dog. Btw, I’m new to this blog. I discovered it, oh, maybe a half hour ago and I’m already in love. Lol. Keep up the great work! What an inspiring story. Thanks for sharing! Sometimes we don’t realize the fat is creeping up until one day we look in the mirror, or at our dog, and it is obvious. It would be great if that point was never reached. As you pointed out, it can take so much more work to reverse it than it would have to stay on top of it in the first place. I know with Chester, he can fluctuate by a pound do to this creep. One day I notice he is getting a little chubby (but know it has been building for a while) so I cut down his food and increase the exercise. Then comes some times when I look at him and say “my gosh he has gotten so skinny” so I up his food a little. It’s always a give and take balance around our house. The important thing is being able to recognize when something needs to be done and being willing to take action. Thanks for reading our blog and taking the time to comment. We are glad you like it! I’m with Kristine: the chart is fine as a rough guide, but it quite frankly does not work for many breeds, particularly the sighthounds. By the time a greyhound is a No. 3, he’s fat. Mine are difficult. Jeffie is super skinny, even for a greyhound, and it’s hard to keep weight on him. He’s a No. 1, for sure, but the vet (who does the greyhound track work in our town so is as near to a greyhound expert as you can hope for in a vet) says he looks fighting fit and perfectly healthy. In fact, when I asked him if he thought Jeffie was too skinny, he snorted and said no, he looks as if he’s just come off the track and could happily go back, in other words, in good, athletic shape. While he has bony protuberances visible at a distance, he does also have great, fat, solid muscles. No body fat to speak of, but muscle he certainly has. Sid, on the other hand is a tripod and a pig when it comes to food. If I didn’t watch him he would become fat, for sure, and a fat greyhound is a horrible, horrible sight! He doesn’t fit ANY of the descriptions between 1 and 3. I can see his bony protuberances at a distance, yet he does have a little visible fat. He has excellent muscles (his professional masseuse calls them ‘ridiculously big’). I can feel all his ribs, and yet if I don’t watch him extremely carefully, he begins to lose his tuck and quite clearly has a fat belly. Luckily, I know what to look for in a greyhound, but if anyone were to go by your chart, he’d be very definitely FAT. The last three greyhound ribs are supposed to be visible. I agree that this chart is not a one-size fit all. It does to a pretty good job for most breeds. However, I really see it as useful because it increases awareness about the weight of one’s pet. The point of the chart to me is to see where our dog falls and ask your vet questions if you have them – if they don’t seem to fit in any of these categories. Yes, it’s a good wake-up call for people with ‘average’ shaped dogs, for sure. I really hate to see fat dogs. We can see that their quality of life is so much less than it could be, but their owners don’t seem to be able to get past their own fuzzy viewpoint. We lost our last Lab, Biscuit, in April last year with a tumour on the heart. She was overweight, and twice on a diet, so we blame ourselves for not persevering. Our current Lab, Polly, is 17 months and definately a 3, and we intend to keep her that way. I am so sorry to hear about your loss. We can’t beat ourselves up because we can never be 100% sure that it was the weight that cased such a problem. However, I do believe that keeping your dog at a healthy weight can help influence the development if diseases. Good for you for keeping track of the body condition of your new doggie. May you have many happy years together! Our mini dachshund pup turned five months old yesterday. Her body has become kind of sleek and seal like, with a belly that hangs down instead of being tucked. She is fed three times a day- equal amounts Natural Instinct freeze-dried raw chicken, Wellness Puppy Core canned puppy food, And Natural Instinct puppy kibble with raw boost nuggets. She has grown so fast over the last two weeks nobody can believe it in her puppy class. She is up to 9.8 lbs. Is she too young to have her portions or feedings cut? My 2 bobs worth as a mini daschie owner. Daschunds will eat anything and always be begging for food with that sad look they have perfected thru years of evolution. Be guided by the weight charts that show your daschie needs to have a waist! Also the head end of their belly should be closer to the ground than the tail end of their belly. Measure the amount of you give with a scale or a measuring cup. Twice a day feeds are probably fine now. Once you measure the food it is easy to adjust the quantity so she is not eating too much. Daily walks would be a great idea to strengthen her muscles . Mini Dashies can walk a long way and it does me and my dog a lot of good! Kibble is good to keep her teeth in good condition. My folks are a bit dumb. I learnt to go to toilet on the paper they put down for me for the last 7 years until one day they forget to put my paper down. Bare,cold tiles Yuck!. Naturally I don’t want to mess up the house so I went outside thru the doggy door to do my business. Finally they realize the only reason I used my paper was I really wanted to make them happy! Don’t give up if your daschie is a bit slow learning to go in the right place. They really want to do the right thing! Don’t forget to praise them or give them treats when they get it right! Worked for me! Dad reckons I was a bit of a slow learner though……..Mum reckons he wean’t strict enough but hey we are all happy now. My wieners are obese!😣 i have 4. Three of them are probably 5s. the 4th, Coco is like a 8😢 Can somebody please post some good resources/groups/forums/blogs for me. I want to be a good mom. Not the mom that never says no and is shortening their life span. Hi Caroline. First, don’t be so hard on yourself. It sounds cliche but the first step is admitting there is a problem. I have no doubt you care for your pups if you are concerned about giving them longer lives. we get the opposite comments on our little mini picasso! he’s a mini but he was the smallest of the bunch he weighs 7lbs. I take him to work and a lot of his toys have some food aspect, i feed him twice a day, he does not starve. but he stays skinny, a lot of ppl have no problem telling us to feed our dogs. the thing is, he loves his walks, i walk him three times a day and he lives for these walks. he walks a lot and that allows him to get extra treats so he’s happy, and i’m happy. Sometimes if i’m feeling sarcastic i’ll tell people i have to start remembering to feed him everyday when ppl ask me why he’s so skinny! Those comments must get annoying. I sometimes get asked if Gretel is sick because she is so fit/thin but it’s usually by people who don’t know much about Dachshunds and especially don’t know they aren’t supposed to be plump little sausages.